Aaron Cox instructs MoDOT’s construction and maintenance employees on the finer points of their jobs. He takes care of workers when they are new on the job and when it’s time to review and renew their skills. 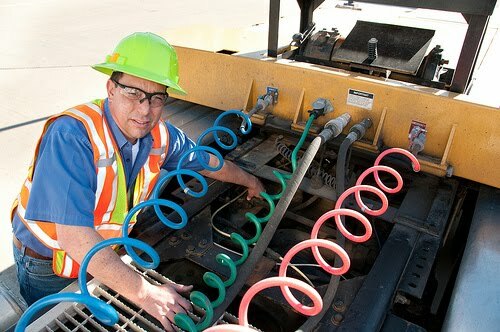 Lately, he’s had every five-year old boy’s dream job – crawling around big dump trucks while instructing the folks who drive them for MoDOT on how to conduct a thorough pre-trip inspection. Inspections help identify defects before they become problems. 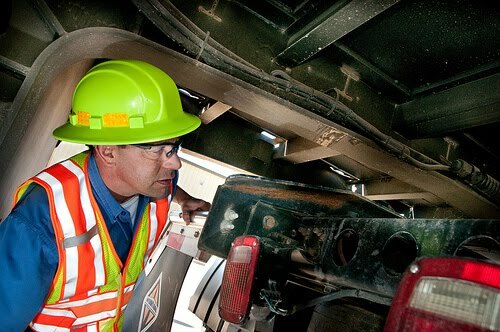 Just like commercial truck drivers, our folks check headlamps, signals, tires, mechanical and braking systems and such for anything that’s not just right before and after every trip. Aaron reminds employees to monitor the performance and handling of the truck on the road, too. If they find a hint of a problem, mechanics can take care of it before it becomes expensive to repair or, more importantly, before it results in a crash. He knows that by keeping our vehicles in good shape, our workers can help folks that share the highways with our big yellow trucks to ARRIVE ALIVE. The little boy that lives inside Aaron thinks that’s way cool.